Garena Free Fire. Best survival Battle Royale on mobile! 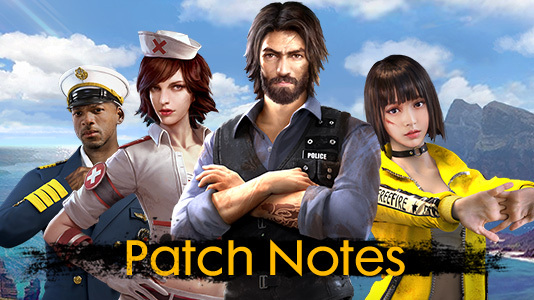 Play as four different characters, complete with their own stories for you to unravel as your play Free Fire. Level these characters up using gold and progressively unlock a minor survival skill for each of them. What's more, receive a free permanent character upon logging in. With a clipsize of 100, this machine gun can easily destroy incoming vehicles. Only available in airdrops. Boom! Grenades have been added into the game! As a tribute to our South-east Asian roots, a three-seater taxi has been added to the game. A must-try if you travel to South-east Asia. Added more rocks and forested areas to act as cover. New type of item in the store - bundles. 4 character-specific costumes with a special action button on the starting island. Name change is now possible in the profile page. Overall improvement on anti-hack detection & prevention. Optimizing multiple bullet hack detection. Suspension of accounts who use 3rd-party software on daily basis. Minor tweaks on durability of equipment. Overhaul of female character and her animation. Aim precision can now be toggled in settings. Guilds can now be disbanded. You can now add teammates who are in the same squad as friends. Stats of your teammates will be shown at the end of a game. Slightly reduced the size of the pan and parang. Join the Free Fire World Cup!